Jupiter 10 June 2016 01:49 UT Dia. 36.1"
Scope: Celestron 14" XLT, F25, Optical Attachments: 2.5x TeleVue PowerMate, Camera: ASI174MM, Chroma Technologies RGB filters, Mount: Celestron CGE Pro. Exposures: 120 sec of data ea. channel at 60% histogram. Location: Driveway, Dallas, Tx. USA, Conditions: Seeing very good 7/10, Temp. ~88 deg. F, Acquisition SW: FireCapture, Processing: Autostakkert 2 align stack (40% frame selection), Registax wavelet processing, WinJupos Derotate, RGB combine, Photoshop/Topaz final adjustments. Click on the image to see a larger version. Jupiter 30 April 2016 01:34 UT Dia. 40.8"
Scope: Celestron 14" XLT, F25, Optical Attachments: 2.5x TeleVue PowerMate, Camera: ASI174MM, Chroma Technologies RGB filters, Mount: Celestron CGE Pro. Exposures: 120 sec of data ea. channel at 55% histogram. Location: Driveway, Dallas, Tx. USA, Conditions: Seeing poor 4/10, Temp. ~66 deg. F, Acquisition SW: FireCapture, Processing: Autostakkert 2 align stack (40% frame selection), Registax wavelet processing, WinJupos Derotate, RRGB combine, Photoshop/Topaz final adjustments. Click on the image to see a larger version. 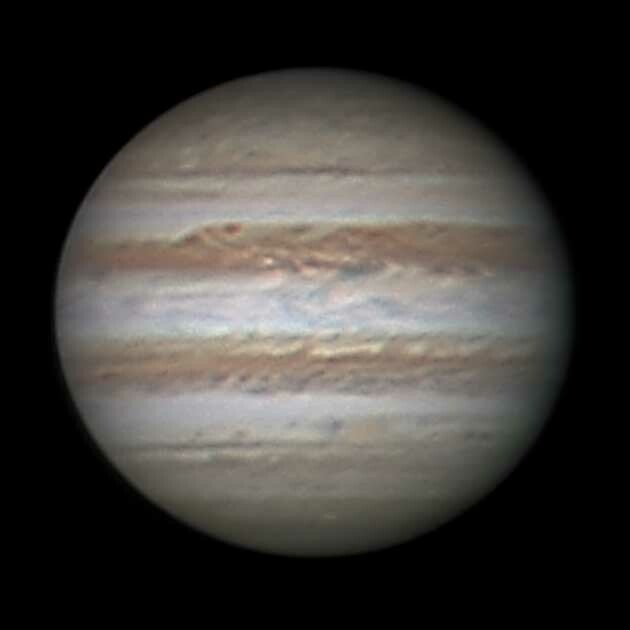 Jupiter 29 Feb. 2016 07:29 UT Dia. 44.3"
Scope: Celestron 14" XLT, F25, Optical Attachments: 2.5x TeleVue PowerMate, Camera: ASI174MM, Chroma Technologies RGB filters, Mount: Celestron CGE Pro. Exposures: 120 sec of data ea. channel at 50% histogram. Location: Driveway, Dallas, Tx. USA, Conditions: Seeing good 7/10, Temp. ~60 deg. F, Acquisition SW: FireCapture, Processing: Autostakkert 2 align stack (75% frame selection), Registax wavelet processing, WinJupos Derotate, RGB combine, Photoshop/Topaz final adjustments. Click on the image to see a larger version. Jupiter 29 Feb. 2016 07:16 UT Dia. 44.3"
Scope: Celestron 14" XLT, F25, Optical Attachments: 2.5x TeleVue PowerMate, Camera: ASI174MM, Chroma Technologies RGB filters, Mount: Celestron CGE Pro. Exposures: 120 sec of data ea. channel at 50% histogram. Location: Driveway, Dallas, Tx. USA, Conditions: Seeing good 7/10, Temp. ~60 deg. F, Acquisition SW: FireCapture, Processing: Autostakkert 2 align stack (10% frame selection), Registax wavelet processing, WinJupos Derotate, RGB combine, Photoshop/Topaz final adjustments. Click on the image to see a larger version. Jupiter 29 Jan. 2016 10:59 UT Dia. 42.3"
Scope: Celestron 14" XLT, F25, Optical Attachments: 2.5x TeleVue PowerMate, Camera: ASI174MM, Chroma Technologies RGB filters, Mount: Celestron CGE Pro. Exposures: 120 sec of data ea. channel at 50% histogram. Location: Driveway, Dallas, Tx. USA, Conditions: Seeing good 7/10, Temp. ~40 deg. F, Acquisition SW: FireCapture, Processing: Autostakkert 2 align stack (10% frame selection), Registax wavelet processing, WinJupos Derotate, RGB combine, Photoshop/Topaz final adjustments. Click on the image to see a larger version. Scope: Celestron 14" XLT, F25, Optical Attachments: 2.5x TeleVue PowerMate, Camera: ASI174MM, Chroma Technologies RGB filters, Mount: Celestron CGE Pro. Exposures: 120 sec of data ea. channel at 67% histogram. Location: Driveway, Dallas, Tx. USA, Conditions: Seeing good 6/10, Temp. ~35 deg. F, Acquisition SW: FireCapture, Processing: Autostakkert 2 align stack (20% frame selection), Registax wavelet processing, WinJupos Derotate, RGB combine, Photoshop/Topaz final adjustments. Click on the image to see a larger version. Jupiter 17 Dec. 2015 12:48 UT Dia. 37.4"
Scope: Celestron 14" XLT, F25, Optical Attachments: 2.5x TeleVue PowerMate, Camera: ASI120MM, Chroma Technologies RGB filters, Mount: Celestron CGE Pro. Exposures: 120 sec of data ea. channel at 77% histogram. Location: Driveway, Dallas, Tx. USA, Conditions: Seeing good 7/10, Temp. ~40 deg. 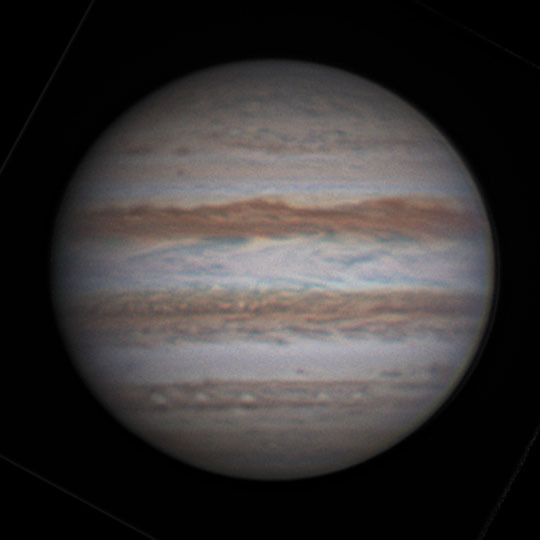 F, Acquisition SW: FireCapture, Processing: Autostakkert 2 align stack (40% frame selection), Registax wavelet processing, WinJupos Derotate, RGB combine, Photoshop/Topaz final adjustments. Click on the image to see a larger version. 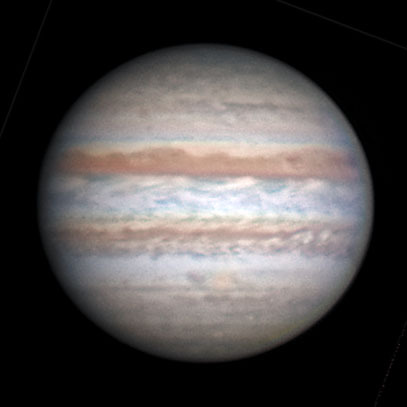 Jupiter 07 Dec. 2015 12:58 UT Dia. 36.3"
Scope: Celestron 14" XLT, F25, Optical Attachments: 2.5x TeleVue PowerMate, Camera: ASI120MM, Chroma Technologies RGB filters, Mount: Celestron CGE Pro. Exposures: 120 sec of data ea. channel at 55% histogram. Location: Driveway, Dallas, Tx. USA, Conditions: Seeing good 7/10, Temp. ~40 deg. 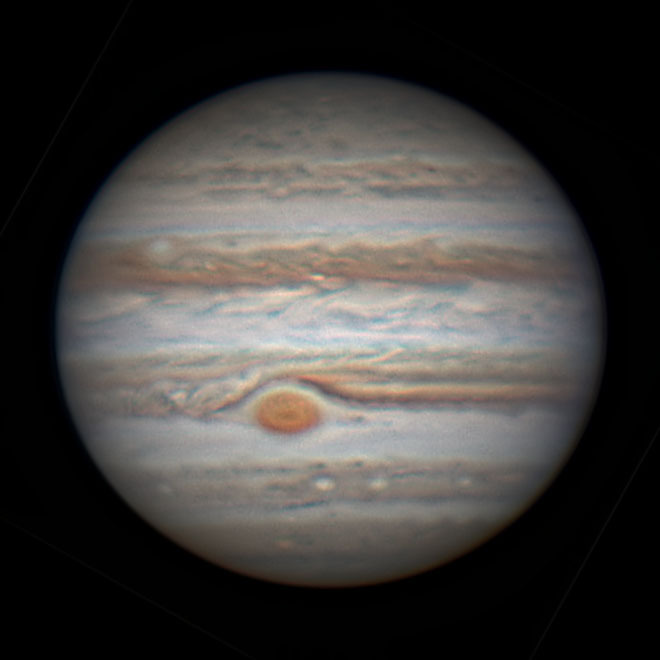 F, Acquisition SW: FireCapture, Processing: Autostakkert 2 align stack (30% frame selection), Registax wavelet processing, WinJupos Derotate, RGB combine, Photoshop/Topaz final adjustments. Click on the image to see a larger version. Jupiter 04 May 2015 01:45 UT Dia. 37.3"
Scope: Celestron 14" XLT, F25, Optical Attachments: 2.5x TeleVue PowerMate, Camera: ASI120MM, Chroma Technologies RGB filters, Mount: Celestron CGE Pro. Exposures: 120 sec of data ea. channel at 45% histogram. Location: Driveway, Dallas, Tx. USA, Conditions: Seeing good 6/10, Temp. ~75 deg. F, Acquisition SW: FireCapture, Processing: Autostakkert 2 align stack (40% frame selection), Registax wavelet processing, WinJupos Derotate, RGB combine, Photoshop/Topaz final adjustments. Click on the image to see a larger version. 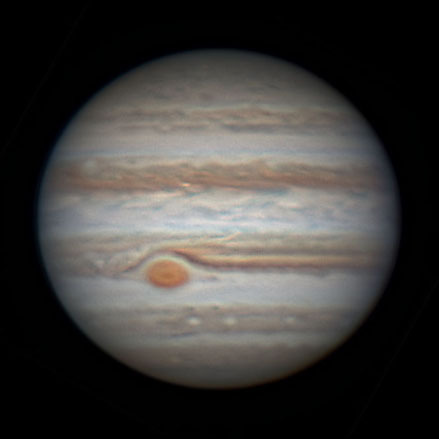 Jupiter 01 May 2015 03:00 UT Dia. 37.8"
Scope: Celestron 14" XLT, F25, Optical Attachments: 2.5x TeleVue PowerMate, Camera: ASI120MM, Chroma Technologies RGB filters, Mount: Celestron CGE Pro. Exposures: 120 sec of data ea. channel at 55% histogram. Location: Driveway, Dallas, Tx. USA, Conditions: Seeing good 6/10, Temp. ~65 deg. F, Acquisition SW: FireCapture, Processing: Autostakkert 2 align stack (50% frame selection), Registax wavelet processing, WinJupos Derotate, RGB combine, Photoshop/Topaz final adjustments. Click on the image to see a larger version. Months later (August) I went back to look at the Jupiter data that I collected on the night of April 16th. I processed one of the other data sets that I collected that night and produced an even better Jupiter image than I had originally produced. I would call the seeing for this data set very good 8/10. When processing I selected 30% of the frames from each channel. Otherwise the equipment and processing information is identical to the acquisition below. Click on the image to see a larger version. Later, in May of 2016 I revisited this data. 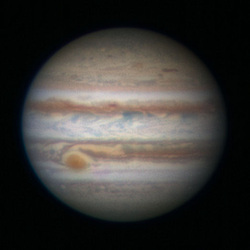 I reprocessed the data selecting 50% of the frames and used the Registax tools RGB align and RGB auto levels. I believe that the result is an improvement in the image quality. Scope: Celestron 14" XLT, F25, Optical Attachments: 2.5x TeleVue PowerMate, Camera: ASI120MM, Chroma Technologies RGB filters, Mount: Celestron CGE Pro. Exposures: 120 sec of data ea. channel at 55% histogram. Location: Driveway, Dallas, Tx. USA, Conditions: Seeing good 7/10, Temp. ~70 deg. F, Acquisition SW: FireCapture, Processing: Autostakkert 2 align stack (25% frame selection), Registax wavelet processing, WinJupos Derotate, RGB combine, Photoshop/Topaz final adjustments. Click on the image to see a larger version. 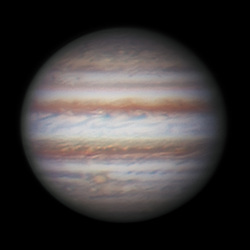 Jupiter 10 February 2015 06:13 UT Dia. 45.8"
Scope: LX200GPS 12" F25, Optical Attachments: 2.5x TeleVue PowerMate, Camera: ASI120MM, Chroma Technologies RGB filters, Mount: LX200, Super Field Tripod, Super Wedge. Exposures: 180 sec of data ea. channel at 80% histogram. Location: Driveway, Dallas, Tx. USA, Conditions: Seeing very good 8/10, Temp. ~55 deg. 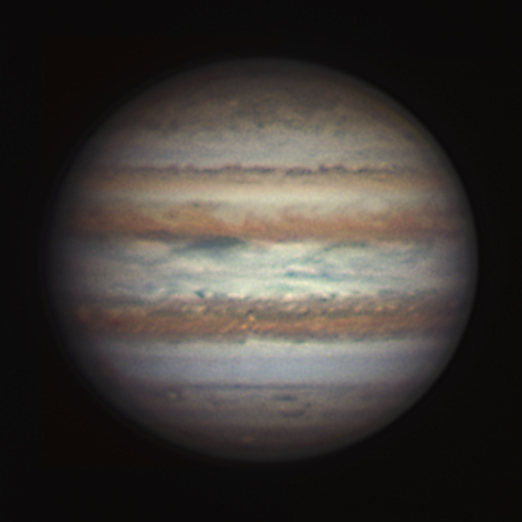 F, Acquisition SW: FireCapture, Processing: Autostakkert 2 align stack (25% frame selection), Registax wavelet processing, WinJupos Derotate, RGB combine, Photoshop/Topaz final adjustments. Click on the image to see a larger version. Jupiter 28 January 2015 06:53 UT Dia. 45.2"
Scope: LX200GPS 12" F25, Optical Attachments: 2.5x TeleVue PowerMate, Camera: ASI120MM, Astronomik Type 2 RGB filters, Mount: LX200, Super Field Tripod, Super Wedge. Exposures: 180 sec of data ea. channel at 65-70% histogram. Location: Driveway, Dallas, Tx. USA, Conditions: Seeing good 6/10, Temp. ~50 deg. F, Acquisition SW: FireCapture, Processing: Autostakkert 2 align stack (35% frame selection), Registax wavelet processing, WinJupos Derotate, RGB combine, Photoshop/Topaz final adjustments. Click on the image to see a larger version. 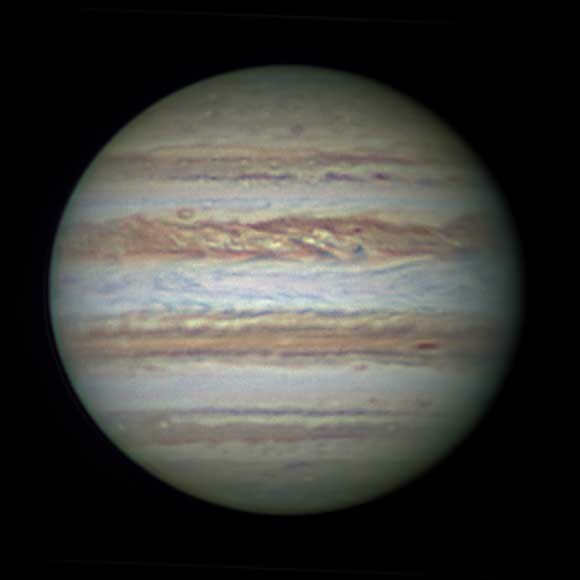 Jupiter 07 November 2014 12:20 UT Dia. 37.1"
Scope: LX200GPS 12" F25, Optical Attachments: 2.5x TeleVue PowerMate, Camera: ASI120MM, Astronomik Type 2 RGB filters, Mount: LX200, Super Field Tripod, Super Wedge. Exposures: 180 sec of data ea. channel at 65-70% histogram. Location: Driveway, Dallas, Tx. USA, Conditions: Seeing very good 7/10, Temp. ~50 deg. F, Acquisition SW: FireCapture, Processing: Autostakkert 2 align stack (2000 frame selection), Registax wavelet processing, WinJupos Derotate, RGB combine, Photoshop/Topaz final adjustments. Click on the image to see a larger version. Jupiter 30 October 2014 12:27 UT Dia. 36.2"
Scope: LX200GPS 12" F25, Optical Attachments: 2.5x TeleVue PowerMate, Camera: ASI120MM, Astronomik Type 2 RGB filters, Mount: LX200, Super Field Tripod, Super Wedge. Exposures: 180 sec of data ea. channel at 65-70% histogram. Location: Driveway, Dallas, Tx. USA, Conditions: Seeing good 6/10, Temp. ~57 deg. F, Acquisition SW: FireCapture, Processing: Autostakkert 2 align stack (2000 frame selection), Registax wavelet processing, WinJupos Derotate, RGB combine, Photoshop/Topaz final adjustments. Click on the image to see a larger version. Jupiter 26 October 2014 12:20 UT Dia. 35.8"
Scope: LX200GPS 12" F25, Optical Attachments: 2.5x TeleVue PowerMate, Camera: ASI120MM, Astronomik Type 2 RGB filters, Mount: LX200, Super Field Tripod, Super Wedge. Exposures: 180 sec of data ea. channel at 65-70% histogram. Location: Driveway, Dallas, Tx. USA, Conditions: Seeing good 6/10, Temp. ~67 deg. F, Acquisition SW: FireCapture, Processing: Autostakkert 2 align stack (40% selection), Registax wavelet processing, WinJupos Derotate, RGB combine, Photoshop/Topaz final adjustments. Click on the image to see a larger version. Jupiter 21 October 2014 12:23 UT Dia. 35.4"
Scope: LX200GPS 12" F25, Optical Attachments: 2.5x TeleVue PowerMate, Camera: ASI120MM, Astronomik Type 2 RGB filters, Mount: LX200, Super Field Tripod, Super Wedge. Exposures: 180 sec of data ea. channel at 65-70% histogram. Location: Driveway, Dallas, Tx. USA, Conditions: Seeing very good 7/10, Temp. ~60 deg. F, Acquisition SW: FireCapture, Processing: Autostakkert 2 align stack (25% selection), Registax wavelet processing, WinJupos Derotate, RGB combine, Photoshop/Topaz final adjustments. Click on the image to see a larger version. Jupiter 15 October 2014 12:00 UT Dia. 35"
Scope: LX200GPS 12" F25, Optical Attachments: 2.5x TeleVue PowerMate, Camera: ASI120MM, Astronomik Type 2 RGB filters, Mount: LX200, Super Field Tripod, Super Wedge. Exposures: 180 sec of data ea. channel at 65-70% histogram. Location: Driveway, Dallas, Tx. USA, Conditions: Seeing good 6/10, Temp. ~55 deg. F, Acquisition SW: FireCapture, Processing: Autostakkert 2 align stack (20% selection), Registax wavelet processing, WinJupos Derotate, RGB combine, Photoshop/Topaz final adjustments. Click on the image to see a larger version. 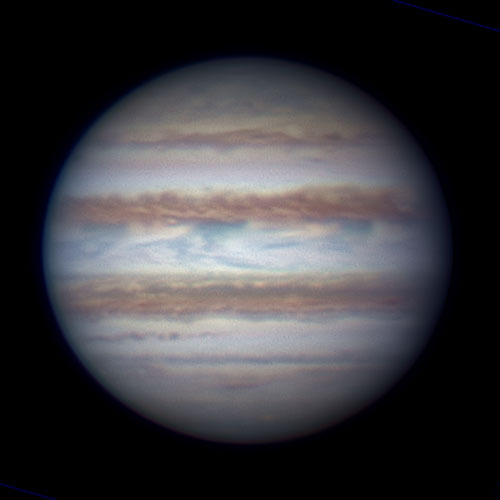 Jupiter 23 April 2014 02:17 UT Dia. 36"
Scope: LX200GPS 12" F25, Optical Attachments: 2.5x TeleVue PowerMate, Camera: ASI120MM, Astronomik Type 2 RGB filters, Mount: LX200, Super Field Tripod, Super Wedge. Exposures: 120 sec of data ea. channel at 65-70% histogram. Location: Driveway, Dallas, Tx. USA, Conditions: Seeing good 6/10, Temp. ~60 deg. F, Acquisition SW: FireCapture, Processing: Autostakkert 2 align stack (25% selection), Registax wavelet processing, WinJupos Derotate, RGB combine, Photoshop/Topaz final adjustments. Notice the moon Io near the center of the disk of Jupiter. Click on the image to see a larger version. Jupiter 16 April 2014 01:21 UT Dia. 36.7"
Scope: LX200GPS 12" F25, Optical Attachments: 2.5x TeleVue PowerMate, Camera: ASI120MM, Astronomik Type 2 RGB filters, Mount: LX200, Super Field Tripod, Super Wedge. Exposures: 120 sec of data ea. channel at 65-70% histogram. Location: Driveway, Dallas, Tx. USA, Conditions: Seeing good 6/10, Temp. ~60 deg. 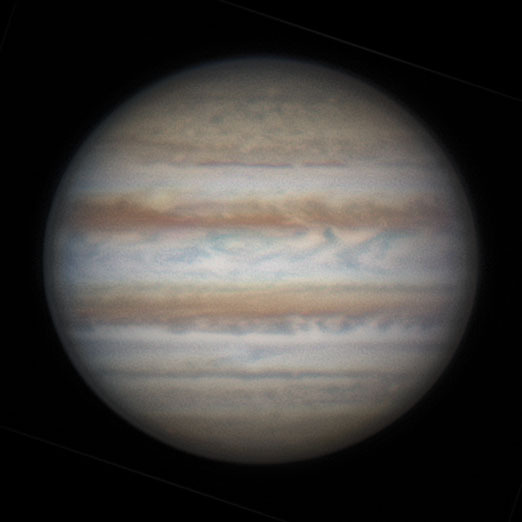 F, Acquisition SW: FireCapture, Processing: Autostakkert 2 align stack (40% selection), Registax wavelet processing, WinJupos Derotate, RGB combine, Photoshop/Topaz final adjustments. 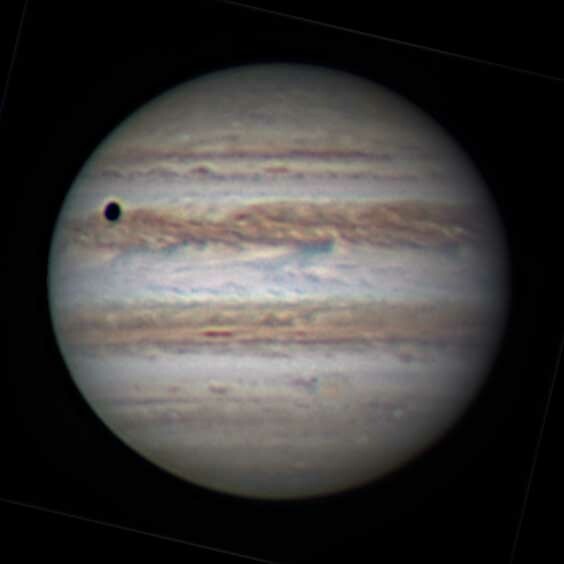 Notice Io near the right limb of Jupiter and the shadow of Io near the center of the disk of Jupiter. Click on the image to see a larger version. 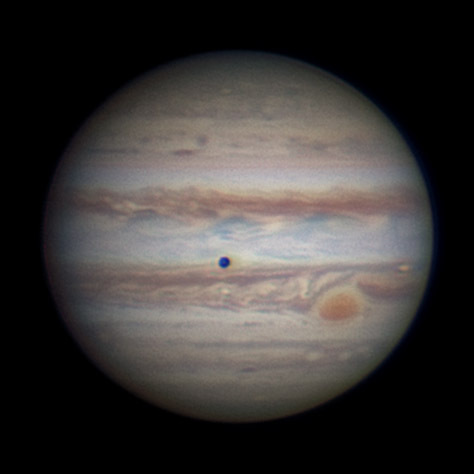 Jupiter 30 March 2014 01:46 UT Dia. 38.7"
Scope: LX200GPS 12" F25, Optical Attachments: 2.5x TeleVue PowerMate, Camera: ASI120MM, Astronomik Type 2 RGB filters, Mount: LX200, Super Field Tripod, Super Wedge. Exposures: 120 sec of data ea. channel at 65-70% histogram. Location: Driveway, Dallas, Tx. USA, Conditions: Seeing poor 4/10, Temp. ~60 deg. F, Acquisition SW: FireCapture, Processing: Autostakkert 2 align stack (35% selection), Registax wavelet processing, WinJupos Derotate, RGB combine, Photoshop/Topaz final adjustments. Click on the image to see a larger version. Jupiter 20 March 2014 01:38 UT Dia. 40.0"
Scope: LX200GPS 12" F25, Optical Attachments: 2.5x TeleVue PowerMate, Camera: ASI120MM, Astronomik Type 2 RGB filters, Mount: LX200, Super Field Tripod, Super Wedge. Exposures: 120 sec of data ea. channel at 65-70% histogram. 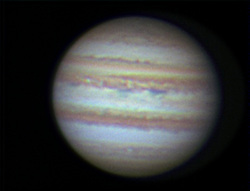 Two RGB data sets were combined with WinJupos to compose this image. A total of 12 minutes of video data collected over a 16 minute interval was utilized in this image. Location: Driveway, Dallas, Tx. USA, Conditions: Seeing good 6/10, Temp. ~60 deg. F, Acquisition SW: FireCapture, Processing: Autostakkert 2 align stack (25% selection), Registax wavelet processing, WinJupos Derotate, RGB combine, Photoshop/Topaz final adjustments. Click on the image to see a larger version. Jupiter 14 March 2014 01:03 UT Dia. 40.8"
Scope: LX200GPS 12" F25, Optical Attachments: 2.5x TeleVue PowerMate, Camera: ASI120MM, Astronomik Type 2 RGB filters, Mount: LX200, Super Field Tripod, Super Wedge. Exposures: 120 sec of data ea. channel at 65-70% histogram. Location: Driveway, Dallas, Tx. USA, Conditions: Seeing average 5/10, Temp. ~60 deg. 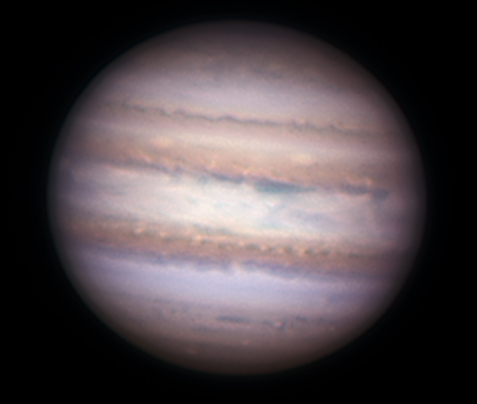 F, Acquisition SW: FireCapture, Processing: Autostakkert 2 align stack (75% selection), Registax wavelet processing, WinJupos Derotate, RGB combine, Photoshop/Topaz final adjustments. Click on the image to see a larger version. The shadow is from Europa. 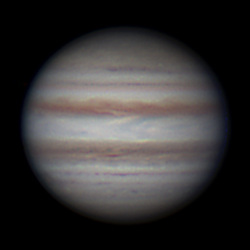 Jupiter 24 February 2014 02:20 UT Dia. 43.1"
Scope: LX200GPS 12" F25, Optical Attachments: 2.5x TeleVue PowerMate, Camera: ASI120MM, Astronomik Type 2 RGB filters, Mount: LX200, Super Field Tripod, Super Wedge. Exposures: 120 sec of data ea. channel at 65-70% histogram. Location: Driveway, Dallas, Tx. USA, Conditions: Seeing poor 4/10, Temp. ~60 deg. F, Acquisition SW: FireCapture, Processing: Autostakkert 2 align stack (50% selection), Registax wavelet processing, WinJupos Derotate, RGB combine, Photoshop/Topaz final adjustments. Click on the image to see a larger version. In addition to poor seeing the conditions included wind and intermittent clouds. 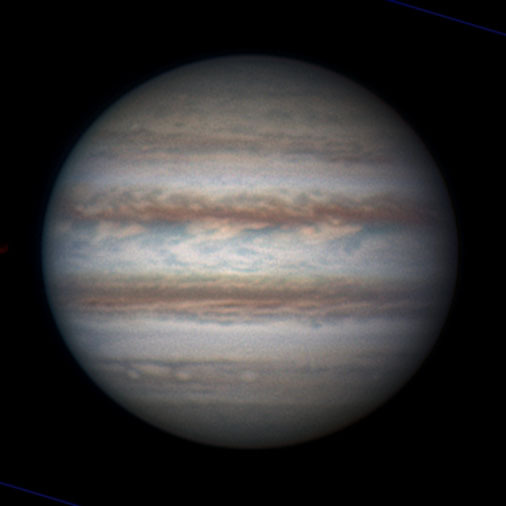 Jupiter 03 January 2014 06:58 UT Dia. 46.8"
Scope: LX200GPS 12" F25, Optical Attachments: 2.5x TeleVue PowerMate, Camera: ASI120MM, Astronomik Type 2 RGB filters, Mount: LX200, Super Field Tripod, Super Wedge. Exposures: 120 sec of data ea. channel at 65-70% histogram. Three RGB data sets were combined with WinJupos to compose this image. A total of 18 minutes of video data collected over a 30 minute interval was utilized in this image. Location: Driveway, Dallas, Tx. USA, Conditions: Seeing very good 7/10, Temp. ~32 deg. F, Acquisition SW: FireCapture, Processing: Autostakkert 2 align stack (30% selection), Registax wavelet processing, WinJupos Derotate, RGB combine, Photoshop/Topaz final adjustments. Click on the image to see a larger version. Jupiter 03 November 2013 12:25 UT Dia. 41.6"
Scope: LX200GPS 12" F25, Optical Attachments: 2.5x TeleVue PowerMate, Camera: ASI120MM, Astronomik Type 2 RGB filters, Mount: LX200, Super Field Tripod, Super Wedge. Exposures: 120 sec of data (9200 Frames R & G channels, 7000 frames B) ea. channel at 65% histogram. Location: Driveway, Dallas, Tx. USA, Conditions: Seeing good 6/10, Temp. ~45 deg. F, Acquisition SW: FireCapture, Processing: Autostakkert 2 align stack (50% selection), Registax wavelet processing, WinJupos Derotate, RGB combine, Photoshop/Topaz final adjustments. Collected data at ~78 fps for R & G channels, 58 fps B. Click on the image to see a larger version. Jupiter 23 October 2013 11:39 UT Dia. 40.2"
Scope: LX200GPS 12" F25, Optical Attachments: 2.5x TeleVue PowerMate, Camera: ASI120MM, Astronomik Type 2 RGB filters, Mount: LX200, Super Field Tripod, Super Wedge. Exposures: 120 sec of data (9200 Frames R & G channels, 7000 frames B) ea. channel at 65% histogram. Location: Driveway, Dallas, Tx. USA, Conditions: Seeing good 6/10, Temp. ~55 deg. 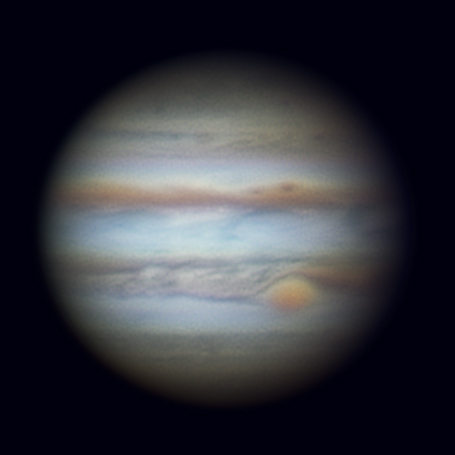 F, Acquisition SW: FireCapture, Processing: Autostakkert 2 align stack (60% selection), Registax wavelet processing, WinJupos Derotate, RGB combine, Photoshop/Topaz final adjustments. Collected data at ~78 fps for R & G channels, 58 fps B. Click on the image to see a larger version. Jupiter 20 October 2013 12:22 UT Dia. 39.9"
Scope: LX200GPS 12" F25, Optical Attachments: 2.5x TeleVue PowerMate, Camera: ASI120MM, Astronomik Type 2 RGB filters, Mount: LX200, Super Field Tripod, Super Wedge. Exposures: 120 sec of data (9200 Frames R & G channels, 7000 frames B) ea. channel at 65% histogram. Location: Driveway, Dallas, Tx. USA, Conditions: Seeing good 6/10, Temp. ~42 deg. F, Acquisition SW: FireCapture, Processing: Autostakkert 2 align stack (60% selection), Registax wavelet processing, WinJupos Derotate, RGB combine, Photoshop/Topaz final adjustments. Collected data at ~78 fps for R & G channels, 58 fps B. Click on the image to see a larger version. Scope: LX200GPS 12" F25, Optical Attachments: 2.5x TeleVue PowerMate, Camera: ASI120MM, Astronomik Type 2 RGB filters, Mount: LX200, Super Field Tripod, Super Wedge. Exposures: 120 sec of data (9200 Frames R & G channels, 7000 frames B) ea. channel at 65% histogram. Location: Driveway, Dallas, Tx. USA, Conditions: Seeing average 5/10, Temp. ~65 deg. F, Acquisition SW: FireCapture, Processing: Autostakkert 2 align stack (40% selection), Registax wavelet processing, WinJupos Derotate, RGB combine, Photoshop/Topaz final adjustments. Collected data at ~78 fps for R & G channels, 58 fps B. Click on the image to see a larger version. Note: The disk of Ganymede (dark disk to lower left, 1.4") and Io (near center of image, 1.0") are visible. 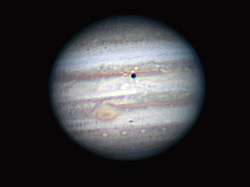 Features can be seen on both Ganymede and Io. Ganymede 10 October 2013 12:15 UT Dia. 1.4"
The above Jupiter image contains an image of Jupiter's moon, Ganymede. It is very rare to capture surface features on the moons of Jupiter. I reprocessed the data to enhance the features visible on Ganymede to produce the enlarged version of the Ganymede image at the left. Click on the image to see this image of Ganymede imbedded in a simulated image of Ganymede produced by the NASA Solar System Simulator. 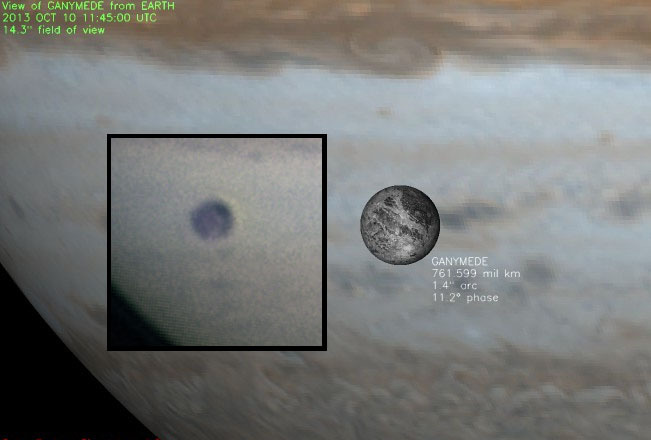 The comparison of the captured image with the simulated image conclusively shows that several features from the surface of Ganymede are visible in the image: a) dark blob on the upper right of the disk, b) dark diagonal feature from upper left to lower right, and c) bright spot at bottom center. Jupiter 08 October 2013 11:57 UT Dia. 38.4"
Scope: LX200GPS 12" F25, Optical Attachments: 2.5x TeleVue PowerMate, Camera: ASI120MM, Astronomik Type 2 RGB filters, Mount: LX200, Super Field Tripod, Super Wedge. Exposures: 120 sec of data (9200 Frames R & G channels, 7000 frames B) ea. channel at 65% histogram. Location: Driveway, Dallas, Tx. USA, Conditions: Seeing average 5/10, Temp. ~55 deg. F, Acquisition SW: FireCapture, Processing: Autostakkert 2 align stack (40% selection), Registax wavelet processing, WinJupos Derotate, RGB combine, Photoshop/Topaz final adjustments. Collected data at ~78 fps for R & G channels, 58 fps B. Click on the image to see a larger version. Jupiter 30 September 2013 12:09 UT Dia. 37.5"
Scope: LX200GPS 12" F25, Optical Attachments: 2.5x TeleVue PowerMate, Camera: ASI120MM, Astronomik Type 2 RGB filters, Mount: LX200, Super Field Tripod, Super Wedge. Exposures: 120 sec of data (9200 Frames R & G channels, 7000 frames B) ea. channel at 60% histogram. Location: Driveway, Dallas, Tx. USA, Conditions: Seeing good 7/10, Temp. ~70 deg. 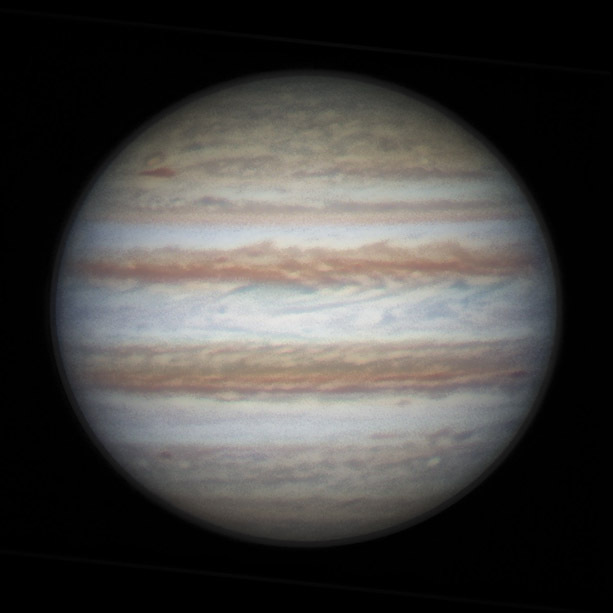 F, Acquisition SW: FireCapture, Processing: Autostakkert 2 align stack (40% selection), Registax wavelet processing, WinJupos Derotate, RGB combine, Photoshop/Topaz final adjustments. Collected data at ~78 fps for R & G channels, 58 fps B. Click on the image to see a larger version. Jupiter 27 September 2013 11:34 UT Dia. 37.2"
Scope: LX200GPS 12" F25, Optical Attachments: 2.5x TeleVue PowerMate, Camera: ASI120MM, Astronomik Type 2 RGB filters, Mount: LX200, Super Field Tripod, Super Wedge. Exposures: 120 sec of data (7700 Frames R & G channels, 7000 frames B) ea. channel at 60% histogram. Location: Driveway, Dallas, Tx. USA, Conditions: Seeing good 6/10, Temp. ~70 deg. F, Acquisition SW: FireCapture, Processing: Autostakkert 2 align stack (40% selection), Registax wavelet processing, WinJupos Derotate, RGB combine, Photoshop/Topaz final adjustments. Collected data at ~64 fps for R & G channels, 58 fps B. Click on the image to see a larger version. Jupiter 25 September 2013 12:09 UT Dia. 37"
Scope: LX200GPS 12" F25, Optical Attachments: 2.5x TeleVue PowerMate, Camera: ASI120MM, Astronomik Type 2 RGB filters, Mount: LX200, Super Field Tripod, Super Wedge. Exposures: 120 sec of data (9300 Frames R & G channels, 6800 frames B) ea. channel at 60% histogram. Location: Driveway, Dallas, Tx. USA, Conditions: Seeing very good 8/10, Temp. ~70 deg. F, Acquisition SW: FireCapture, Processing: Autostakkert 2 align stack (75% selection), Registax wavelet processing, WinJupos Derotate, RGB combine, Photoshop/Topaz final adjustments. Collected data at ~77 fps for R & G channels, 56 fps B. Click on the image to see a larger version. Jupiter 22 September 2013 11:55 UT Dia. 36.6"
Scope: LX200GPS 12" F25, Optical Attachments: 2.5x TeleVue PowerMate, Camera: ASI120MM, Astronomik Type 2 RGB filters, Mount: LX200, Super Field Tripod, Super Wedge. Exposures: 120 sec of data (9300 Frames R & G channels, 6800 frames B) ea. channel at 60% histogram. Location: Driveway, Dallas, Tx. USA, Conditions: Seeing Good 7/10, Temp. ~60 deg. 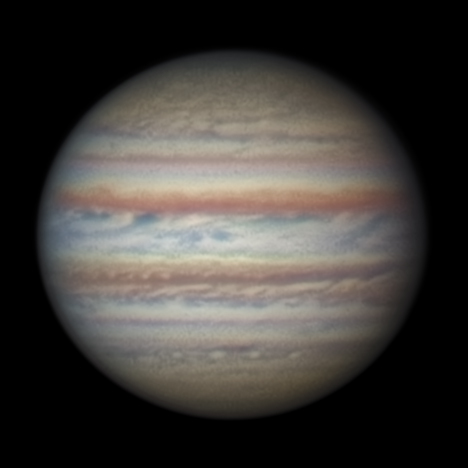 F, Acquisition SW: FireCapture, Processing: Autostakkert 2 align stack (75% selection), Registax wavelet processing, WinJupos Derotate, RGB combine, Photoshop/Topaz final adjustments. Collected data at ~77 fps for R & G channels, 56 fps B. Click on the image to see a larger version. Jupiter 22 September 2013 12:04 UT Dia. 36.6"
Scope: LX200GPS 12" F25, Optical Attachments: 2.5x TeleVue PowerMate, Camera: ASI120MM, Astronomik Type 2 RGB filters, Mount: LX200, Super Field Tripod, Super Wedge. Exposures: 120 sec of data (9300 Frames R & G channels, 6800 frames B) ea. channel at 60% histogram. Location: Driveway, Dallas, Tx. USA, Conditions: Seeing Good 7/10, Temp. ~60 deg. 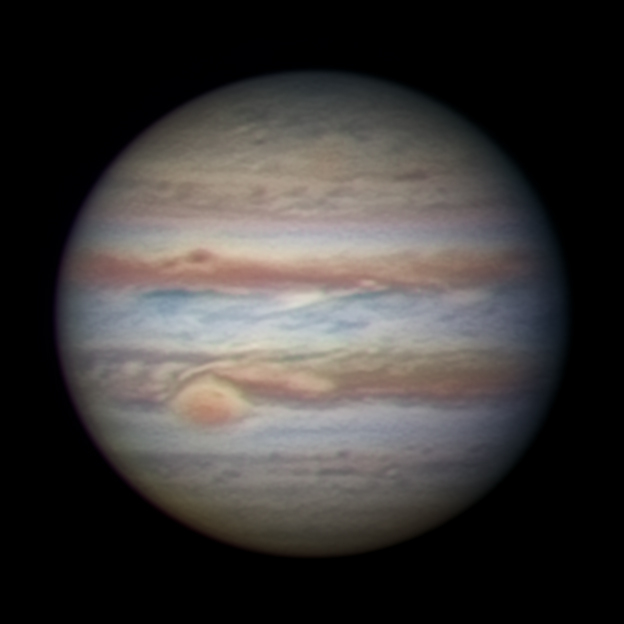 F, Acquisition SW: FireCapture, Processing: Autostakkert 2 align stack (60% selection), Registax wavelet processing, WinJupos Derotate, RGB combine, Photoshop/Topaz final adjustments. Collected data at ~77 fps for R & G channels, 56 fps B. Click on the image to see a larger version. Jupiter 15 September 2013 11:25 UT Dia. 36"
Scope: LX200GPS 12" F25, Optical Attachments: 2.5x TeleVue PowerMate, Camera: ASI120MM, Astronomik Type 2 RGB filters, Mount: LX200, Super Field Tripod, Super Wedge. Exposures: 120 sec of data (6000 Frames R & G channels, 3600 frames B) ea. channel at 70% histogram. Location: Driveway, Dallas, Tx. USA, Conditions: Seeing Good 6/10, Temp. ~77 deg. 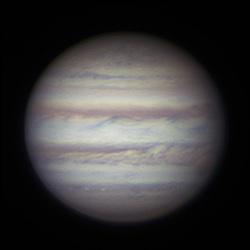 F, Acquisition SW: FireCapture, Processing: Autostakkert 2 align stack (60% selection), Registax wavelet processing, WinJupos Derotate, RRGB combine, Photoshop/Topaz final adjustments. Collected data at ~50 fps for R & G channels, 30 fps B. Click on the image to see a larger version. Jupiter 12 September 2013 11:00 UT Dia. 35.8"
Scope: LX200GPS 12" F25, Optical Attachments: 2.5x TeleVue PowerMate, Camera: ASI120MM, Astronomik Type 2 RGB filters, Mount: LX200, Super Field Tripod, Super Wedge. Exposures: 120 sec of data (6000 Frames R & G channels, 3600 frames B) ea. channel at 65% histogram. Location: Driveway, Dallas, Tx. USA, Conditions: Seeing Very Good 7/10, Temp. ~75 deg. F, Acquisition SW: FireCapture, Processing: Autostakkert 2 align stack (60% selection), Registax wavelet processing, WinJupos Derotate, RRGB combine, Photoshop/Topaz final adjustments. Collected data at ~50 fps for R & G channels, 30 fps B. Click on the image to see a larger version. Jupiter 08 September 2013 11:39 UT Dia. 35.1"
Scope: LX200GPS 12" F25, Optical Attachments: 2.5x TeleVue PowerMate, Camera: ASI120MM, Astronomik Type 2 RGB filters, Mount: LX200, Super Field Tripod, Super Wedge. Exposures: 120 sec of data (7600 Frames R & G channels, 4400 frames B) ea. channel at 70% histogram. Location: Driveway, Dallas, Tx. USA, Conditions: Seeing Good 6/10, Temp. ~75 deg. F, Acquisition SW: FireCapture, Processing: Autostakkert 2 align stack (60% selection), Registax wavelet processing, WinJupos Derotate, RRGB combine, Photoshop/Topaz final adjustments. Collected data at ~70 fps for R & G channels, 42 fps B. Click on the image to see a larger version. Jupiter 06 September 2013 11:56 UT Dia. 35"
Scope: LX200GPS 12" F25, Optical Attachments: 2.5x TeleVue PowerMate, Camera: ASI120MM, Astronomik Type 2 RGB filters, Mount: LX200, Super Field Tripod, Super Wedge. Exposures: 120 sec of data (7200 Frames R & G channels, 3700 frames B) ea. channel at 70% histogram. Location: Driveway, Dallas, Tx. USA, Conditions: Seeing Excellent 8/10, Temp. ~75 deg. F, Acquisition SW: FireCapture, Processing: Autostakkert 2 align stack (60% selection), Registax wavelet processing, WinJupos Derotate, RGB combine, Photoshop/Topaz final adjustments. Collected data at ~60 fps for R & G channels, 33 fps B. Click on the image to see a larger version. Jupiter 06 September 2013 11:46 UT Dia. 35"
Scope: LX200GPS 12" F25, Optical Attachments: 2.5x TeleVue PowerMate, Camera: ASI120MM, Astronomik Type 2 RGB filters, Mount: LX200, Super Field Tripod, Super Wedge. Exposures: 120 sec of data (7200 Frames R & G channels, 3700 frames B) ea. channel at 70% histogram. Location: Driveway, Dallas, Tx. USA, Conditions: Seeing Excellent 8/10, Temp. ~75 deg. F, Acquisition SW: FireCapture, Processing: Autostakkert 2 align stack (60% selection), Registax wavelet processing, WinJupos Derotate, RRGB combine, Photoshop/Topaz final adjustments. Collected data at ~60 fps for R & G channels, 33 fps B. Click on the image to see a larger version. Jupiter 05 September 2013 11:29 UT Dia. 34.9"
Scope: LX200GPS 12" F25, Optical Attachments: 2.5x TeleVue PowerMate, Camera: ASI120MM, Astronomik Type 2 RGB filters, Mount: LX200, Super Field Tripod, Super Wedge. Exposures: 120 sec of data (7200 Frames R & G channels, 3700 frames B) ea. channel at 65% histogram. Location: Driveway, Dallas, Tx. USA, Conditions: Seeing Good 6/10, Temp. ~75 deg. F, Acquisition SW: FireCapture, Processing: Autostakkert 2 align stack (40% selection), Registax wavelet processing, WinJupos Derotate, RRGB combine, Photoshop final adjustments. Collected data at ~60 fps for R & G channels, 33 fps B. Click on the image to see a larger version. Jupiter 01 September 2013 11:37 UT Dia. 34.8"
Scope: LX200GPS 12" F25, Optical Attachments: 2.5x TeleVue PowerMate, Camera: ASI120MM, Astronomik Type 2 RGB filters, Mount: LX200, Super Field Tripod, Super Wedge. Exposures: 120 sec of data (6000 Frames R & G channels, 3700 frames B) ea. channel at 65% histogram. Location: Driveway, Dallas, Tx. USA, Conditions: Seeing Average 5/10, Temp. ~75 deg. F, Acquisition SW: FireCapture, Processing: Autostakkert 2 align stack (30% selection), Registax wavelet processing, WinJupos Derotate, RGB combine, Photoshop final adjustments. Collected data at ~50 fps for R & G channels, 28 fps B. Click on the image to see a larger version. Jupiter 29 August 2013 11:40 UT Dia. 34.5"
Scope: LX200GPS 12" F25, Optical Attachments: 2.5x TeleVue PowerMate, Camera: Point Grey Flea 3 Firewire, Astronomik Type 2 RGB filters, Mount: LX200, Super Field Tripod, Super Wedge. Exposures: 180 sec of data (12500 frames) ea. channel at 80% histogram. Location: Driveway, Dallas, Tx. USA, Conditions: Seeing Very Good 7/10, Temp. ~75 deg. F, Acquisition SW: FireCapture, Processing: Autostakkert 2 align stack (30% selection), Registax wavelet processing, WinJupos Derotate, RRGB combine, Photoshop final adjustments. Collected data at ~70 fps. Click on the image to see a larger version. Jupiter 1 April 2013 01:27 UT Dia. 36"
Scope: LX200GPS 12" F25, Optical Attachments: 2.5x TeleVue PowerMate, Camera: Point Grey Flea 3 Firewire, Chroma Technology RGB filters, Mount: LX200, Super Field Tripod, Super Wedge. Exposures: 120 sec of data (7200 frames) ea. channel at 70% histogram. Location: Driveway, Dallas, Tx. USA, Conditions: Seeing Fair 5/10, Temp. ~65 deg. F, Acquisition SW: FireCapture, Processing: Autostakkert 2 align stack (66% selection), Registax wavelet processing, WinJupos Derotate, RGB combine, Photoshop/Topaz final adjustments. Collected data at ~60 fps. Click on the image to see a larger version. Jupiter 27 Feb. 2013 02:24 UT Dia. 39"
Scope: LX200GPS 12" F25, Optical Attachments: 2.5x TeleVue PowerMate, Camera: Point Grey Flea 3 Firewire, Chroma Technology RGB filters, Mount: LX200, Super Field Tripod, Super Wedge. Exposures: 120 sec of data (7200 frames) ea. channel at 70% histogram. Location: Driveway, Dallas, Tx. USA, Conditions: Seeing Good 6/10, Temp. ~50 deg. F, Acquisition SW: FireCapture, Processing: Autostakkert 2 align stack (66% selection), Registax wavelet processing, WinJupos Derotate, RGB combine, Photoshop/Topaz final adjustments. Collected data at ~60 fps. Click on the image to see a larger version. Jupiter 27 Feb. 2013 01:43 UT Dia. 39"
Scope: LX200GPS 12" F25, Optical Attachments: 2.5x TeleVue PowerMate, Camera: Point Grey Flea 3 Firewire, Chroma Technology RGB filters, Mount: LX200, Super Field Tripod, Super Wedge. Exposures: 120 sec of data (7200 frames) ea. channel at 70% histogram. Location: Driveway, Dallas, Tx. USA, Conditions: Seeing Good 6/10, Temp. ~50 deg. F, Acquisition SW: FireCapture, Processing: Autostakkert 2 align stack (33% selection), Registax wavelet processing, WinJupos Derotate, RGB combine, Photoshop/Topaz final adjustments. Collected data at ~60 fps with lower gain settings than the image below. Click on the image to see a larger version. Jupiter 14 Feb. 2013 01:49 UT Dia. 41"
Scope: LX200GPS 12" F25, Optical Attachments: 2.5x TeleVue PowerMate, Camera: Point Grey Flea 3 Firewire, Mount: LX200, Super Field Tripod, Super Wedge. Exposures: 120 sec of data ea. channel at 70% histogram. Location: Driveway, Dallas, Tx. USA, Conditions: Seeing Good 6/10, Temp. ~50 deg. F, Acquisition SW: FireCapture, Processing: Autostakkert 2 align stack, Registax wavelet processing, WinJupos Derotate, RGB combine, Photoshop final adjustments. 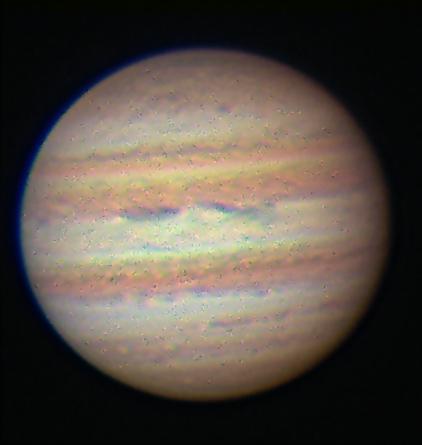 This is my first Jupiter image with Chroma Technology RGB filters. I was able to run at considerably higher frame rates (80 fps for R and G, 50 fps for B). Click on the image to see a larger version. Jupiter 21 Jan. 2013 01:53 UT Dia. 44.5"
Scope: LX200GPS 12" F25, Optical Attachments: 2.5x TeleVue PowerMate, Camera: Point Grey Flea 3 Firewire, Mount: LX200, Super Field Tripod, Super Wedge. Exposures: 180 sec of data ea. channel at 70% histogram. Location: Driveway, Dallas, Tx. USA, Conditions: Seeing Very Good 8/10, Temp. ~45 deg. 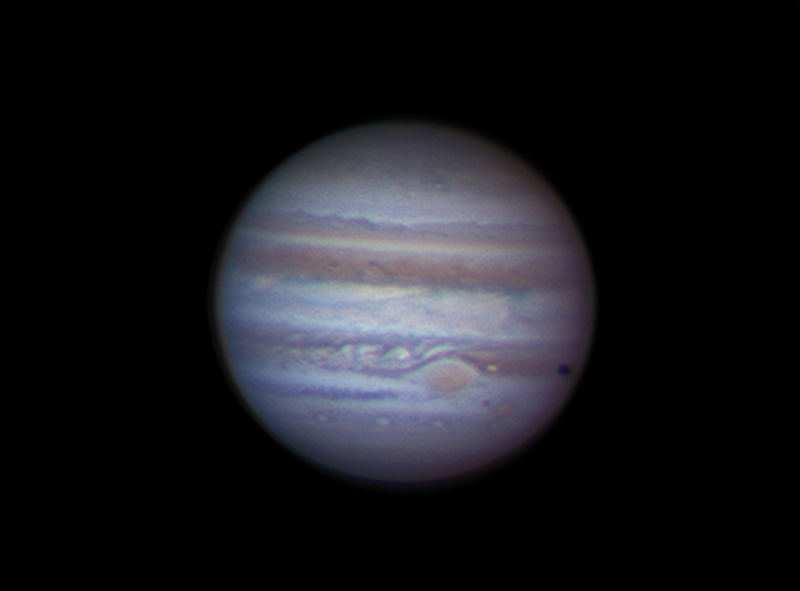 F, Acquisition SW: FireCapture, Processing: Autostakkert 2 align stack, Registax wavelet processing, WinJupos Derotate, RGB combine, Photoshop final adjustments. Click on the image to see a larger version. Jupiter 07 Jan. 2013 03:03 UT Dia. 46"
Scope: LX200GPS 12" F25, Optical Attachments: 2.5x TeleVue PowerMate, Camera: Point Grey Flea 3 Firewire, Mount: LX200, Super Field Tripod, Super Wedge. Exposures: 60 sec of data ea. channel at 70% histogram. Location: Driveway, Dallas, Tx. USA, Conditions: Seeing Very Good 8/10, Temp. ~45 deg. 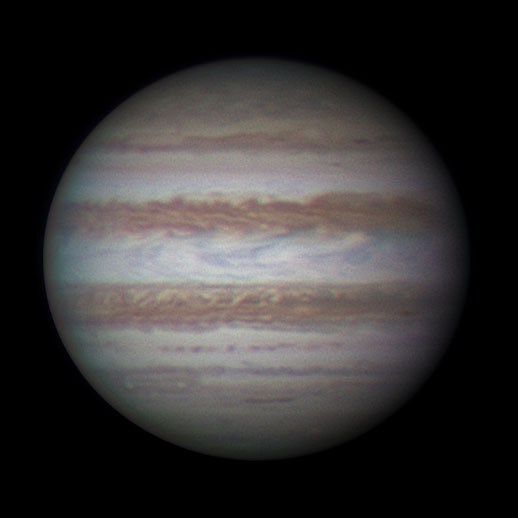 F, Acquisition SW: FireCapture, Processing: Autostakkert 2 align stack, Registax wavelet processing, WinJupos Derotate, RGB combine, Photoshop final adjustments. Click on the image to see a larger version. Jupiter 07 Jan. 2013 02:40 UT Dia. 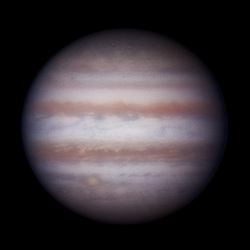 46"
Jupiter 28 Nov. 2012 05:13 UT Dia. 48"
Scope: LX200GPS 12" F25, Optical Attachments: 2.5x TeleVue PowerMate, Camera: Point Grey Flea 3 Firewire, Mount: LX200, Super Field Tripod, Super Wedge. Exposures: 40 sec of data ea. channel at 70% histogram. Location: Driveway, Dallas, Tx. USA, Conditions: Seeing Good 6/10, Temp. ~48 deg. 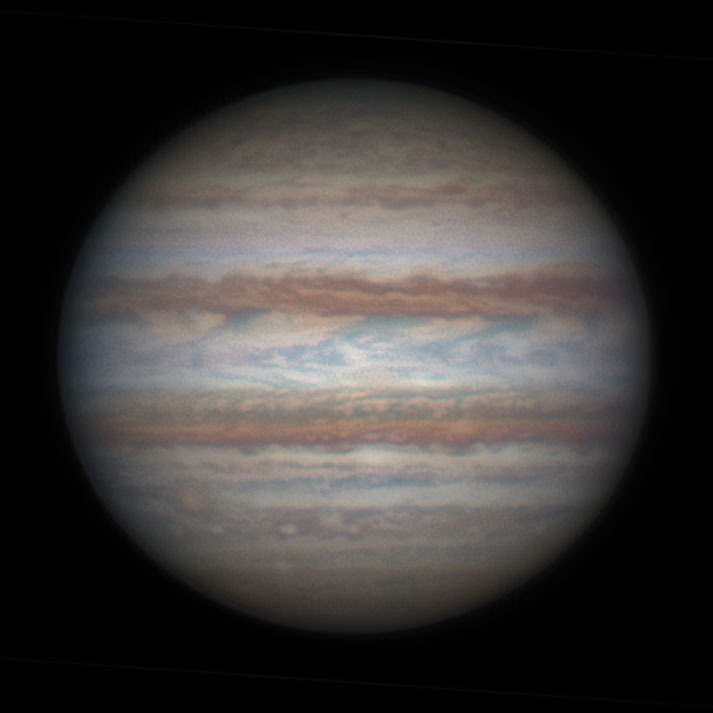 F, Processing: Autostakkert 2 align stack, Registax wavelet processing, Photoshop Hypass filter, RGB combine, resize 125%. Click on the image to see a larger version. Scope: LX200GPS 12" F25, Optical Attachments: 2.5x TeleVue PowerMate, Camera: Point Grey Flea 3 Firewire, Mount: LX200, Super Field Tripod, Super Wedge. Exposures: 60 sec of data ea. channel at 70% histogram. Location: Driveway, Dallas, Tx. USA, Conditions: Seeing Good 6/10, Temp. ~45 deg. 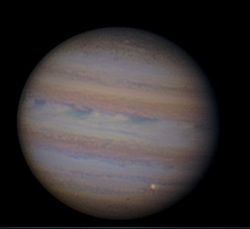 F, Processing: Autostakkert 2 align stack, Registax wavelet processing, Photoshop Hypass filter, RGB combine, resize. Click on the image to see a larger version. Scope: LX200GPS 12" F30, Optical Attachments: 3x TeleVue Barlow, Camera: Point Grey Flea 3 Firewire, Mount: LX200, Super Field Tripod, Super Wedge. Exposures: 40 sec of data ea. channel at 65% histogram. Location: Driveway, Dallas, Tx. USA, Conditions: Seeing 5/10, Temp. ~60 deg. 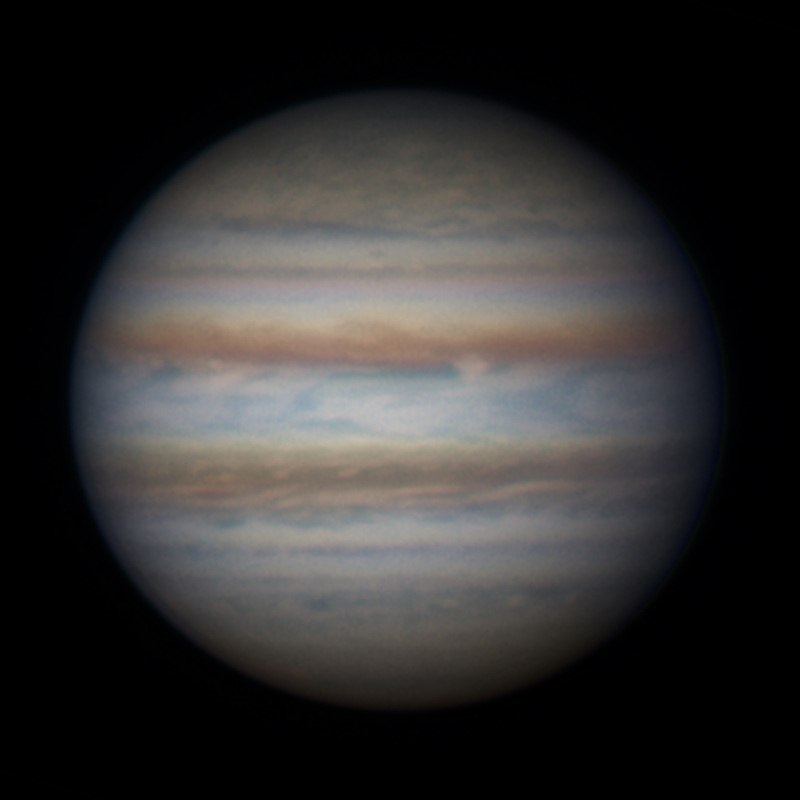 F, Processing: Autostakkert 2 align stack, Registax wavelet processing, Photoshop: LRGB combine, unsharp mask, resize @75%. Click on the image to see a larger version. Scope: LX200GPS 12" F30, Optical Attachments: 3x TeleVue Barlow, Camera: Point Grey Flea 3 Firewire, Mount: LX200, Super Field Tripod, Super Wedge. Exposures: 2000 frames @ 45 FPS R, G and B. 2000 frames @ 30 FPS IR. Location: Driveway, Dallas, Tx. USA, Conditions: Seeing 7/10, Temp. ~70 deg. F, Processing: Registax 1000 frames each for R, G and B,1000 frames for IR, align stack wavelet processing, Photoshop: RGB combine, unsharp mask. Click on the image to see a larger version. 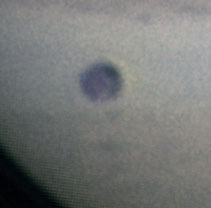 An apparent object impact captured about 6:35 am on Sept. 10, 2012 from Dallas, Texas USA. The impact was observed by Dan Petersen of Racine, Wisconsin visually this morning. His observation was posted later on the ALPO_Jupiter forum. When I saw the post, I went back and examined the videos that I had collected this morning. Click on the image to the left to see a 4 sec video clip of the impact on Flickr. 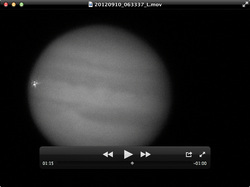 The video was captured with a 12" LX200GPS, 3x Televue Barlow, and Point Grey Flea 3 camera. The capture software was Astro IIDC. Here is a link to a web page hosted by the University of Texas at Dallas with more detailed information and access to the full 2 minute 15 sec video. Scope: LX200GPS 12" F30, Optical Attachments: 3x TeleVue Barlow, Camera: Point Grey Flea 3 Firewire, Mount: LX200, Super Field Tripod, Super Wedge. Exposures: 2000 frames @ 15 FPS R, G and B. 4000 frames @ 30 FPS Lum. Location: Driveway, Dallas, Tx. USA, Conditions: Seeing 6/10, Temp. ~60 deg. F, Processing: Astro IIDC 1000 frames each for R, G and B, 2000 frames for Lum. align stack wavelet processing, Photoshop: unsharp mask. Click on the image to see a larger version. Processing: Reistax select (1500), align, stack, wavelet processing, Photoshop: unsharp mask, bright/contrast. Click on image to see a larger version. Comment: Io's disk is visible just to the left of Io's shadow. Io is 1.13 arc sec in diameter.